It was known that lead was dangerous but manufacturers used lead in glaze to give whiteness and a high quality sheen. It was also found in many of the pottery colours. The most visible signs of lead poisoning were seen in the workforce involved in dipping pottery into glaze. Glaze contained lead carbonate. Raw lead is very soluble. From 1894 fritted lead (heated until it was vitrified and thus less soluble) were introduced but their use was governed by whether the company could afford them and manufacturers were reluctant to change to what they considered was an inferior product. Dippers, because of the dangerous nature of the job were the highest paid workers in the factory. A dipper had a life expectancy of about 40 years but in many cases a particular susceptibility to lead poisoning could lead to death within 12 months of starting work. Women and children were more susceptible than men. However, it was not until 1898 that any restriction on age was introduced into the industry. The workers were willing to work with lead because it was highly paid and perhaps thought they would be one of the lucky ones. Dippers would take Epsom salts to reduce the risk and drank milk to line the stomach. Lead poisoning could come about through inhalation of dust and fumes, or introduction through mouth. Lead tended to be absorbed into the bones from where it affected the tendons of the lower arm. This led to the potter's "dropped wrist" and in some cases "dropped ankle. Lead could also affect the central nervous system, in which case paralysis or epilepsy ensued. In some cases the symptoms did not become evident for many years, sometimes only leading to a general feeling of being unwell. What was not known at the time was that lead also had an effect on the unborn child resulting in miscarriages, still born children, and children who suffered fits and may not live for long. Although workers involved in handling glaze were most directly affected, plumbism also occurred in other departments. Paintresses were at risk, particularly majolica paintresses. Majolica glazes contained 40-60 % lead. "We consider the dipping as the most unhealthy process in the department,"
I have been at work in this department 2 years; have 9 persons working with me male and female. 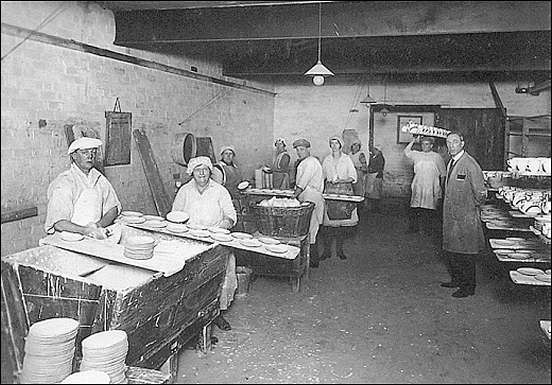 My business is to dip the ware as it comes from the printers and biscuit warehouse; the process does not take a moment, but my hands and arms are always wet with the solution or mixture; I do not know what this mixture is composed of exactly ; it is chiefly lead ; they tell us there is no arsenic, but we have our own thoughts about that; it destroys our health. We are obliged to be very careful by keeping ourselves clean and out of the dust. We have no washing- rooms, but bring the water in a small vessel from a pump in the yard. There are eight boys employed with me; their ages are from 13 up to 17. We come at 7 o'clock is the morning and leave at four, on account of its being bad stuff to work in ; we work the effects off with opening medicine frequently, or it would soon all be over with us. We get better pay here than in any other department of the bank; it is considered of greater risk. I get 27s per week ; the boys 3s. 6d. and 4s. Everything that is made in the factory goes through our hands. I have often observed the effects on persons working with me during my 2 years; it affects women more than men : they have not died, but have been very ill, and have never returned to it again; their places have been filled up by others. Some constitutions that are strong can stand it some time; it has never made me ill. I live at Lane End, about 3 or 4 miles off and can't afford time to go home to my dinner; I always take it here, as you see me, upon the work-bench ; we have no rooms where we can meet altogether to dine in ; I should much better like it if we had, and places wash in. I am married, and have 2 children. In these rooms there are 3 stoves and 4 dipping-troughs, and 7 stock-tubs, all containing fluid. Enoch Booth developed a method of suspending lead oxides in a fluid to allow articles to be immersed in a fluid glaze instead of applying the lead sulphide as a power, the start of 'dipping'. Dipping lead to a change in firing. Previously the lead powder had been sprinkled on the clay ware and fired together to produce a once fired piece. Now with the dipping of ware into a fluid glaze, it was important to fire the ware first to the 'biscuit' stage and subsequently to dip the biscuit ware into the glaze and refire at a lower temperature.